At a nondescript corner along the Ganges in Rishikesh sits 38-year-old Anjana. Stray dogs nibble at her stationery, flies hover around her and the stench of the garbage makes the surrounding unbearable. Yet, Anjana is undeterred. She continues to sketch on a sheet of paper with deep concentration and undivided focus. 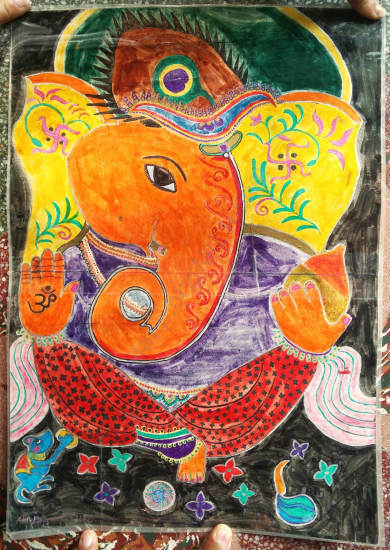 This may seem like the story of any roadside artist, but Anjana is different. She doesn’t have arms and one of her legs is half the length of the other, thus compelling her to squat in order to walk. 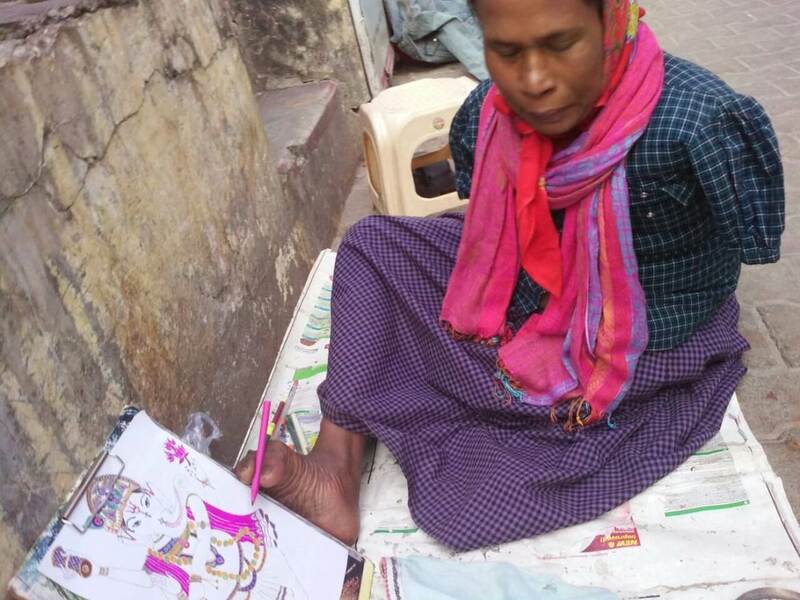 Every day, for over a year, she has been travelling for 6 km to occupy a place along the river and showcase her paintings that she creates deftly with her right foot. Her daily journey is laden with danger as she has to walk long distances on congested roads, cross a bridge, board a ferry and then finally take a spot along the river. Anjana’s commute becomes even more cumbersome during the scorching heat of the summers and the heavy downpour during monsoons. 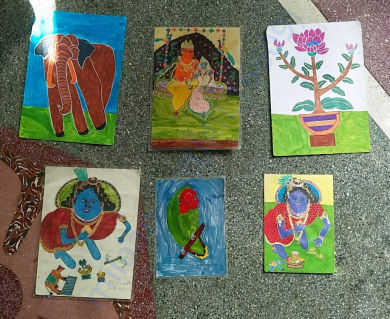 Anjana’s association with art started a year back when she tried to write ‘ram naam’ on pieces of paper with a pen clasped between her toes. Recognizing her talent, a foreign tourist bought her drawing materials and encouraged her to channel her innate talent. 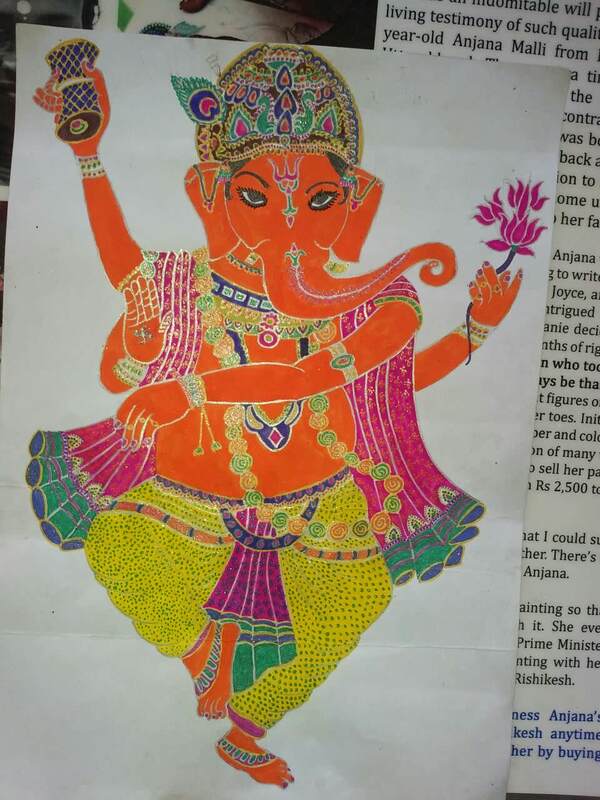 Over the next few months, Anjana undertook relentless efforts to perfect her art and eventually started selling her paintings. Now, art has become her source of income for her earnings help run a family of five. Anjana is the sole breadwinner of the family. Anjana’s brother is paralysed while her brother’s wife has to stay at home to take care of him and their school going children. Her earning of 4000 rupees a month is spent on food, clothing, medicines, school fees and room rent. Anjana’s story is one of inspiration. True to her name – meaning the mother of Lord Hanuman – Anjana has won over numerous physical and financial challenges and remained strong in the face of hardship. 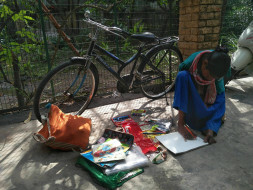 Anjana is determined to provide a better quality of life to her family through her creativity. However, one must realize that her source of income is not steady. Although kind tourists and passersby at times buy her painting equipment, but how will she invest in paper and paints when the inflow of tourists reduces drastically? What will she do when her paintings remain unsold? How will she tide over the crisis of her paintings being washed away in the rains? Will her family go hungry? Will her brother’s children stop going to school? Anjana and her family need security. She yearns for a decent accommodation. She dreams of a stall where she can draw and sell her paintings with dignity. She aspires for a life that is not marred by uncertainty. Anjana is striving every day to do the best she can for her family. 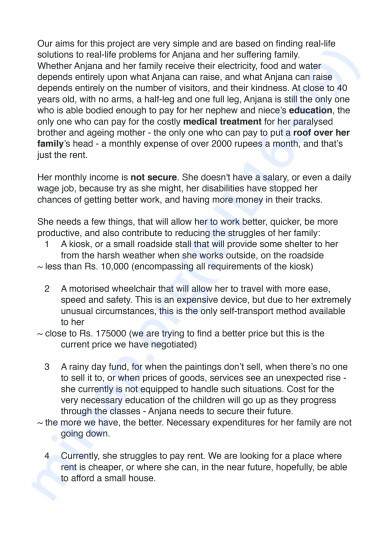 Now, it is our turn to assist Anjana in whichever way possible and transform her dream into reality. 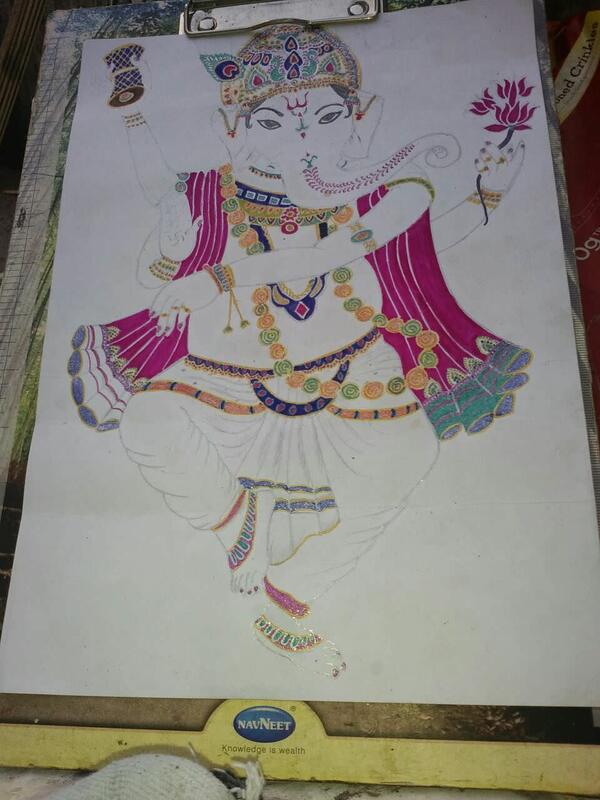 Please do your bit to help her live her dreams, to help her educate her brother’s children, to help her in treating her brother, to help her in providing a better shelter to her family and to help her in taking her art to a higher platform. Let us join hands to take Anjana’s noble efforts forward! 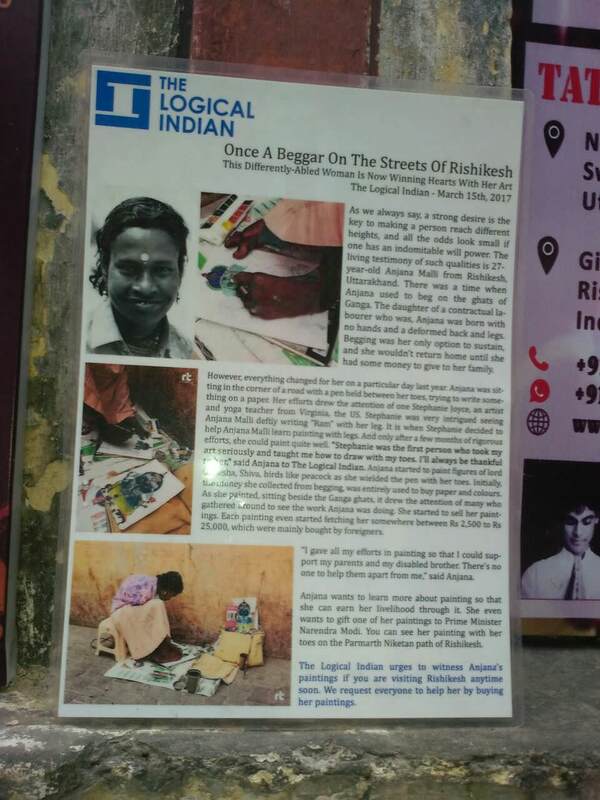 A travel blog talked about how a courageous young woman, bereft of hands eked out a living by painting. The accompanying photograph captured her beautiful smile that one could almost miss the fact that her arms ended in stumps right below the shoulder. Anjana painted with her feet! We felt that Anjana deserved much more than motivation and a story-she deserved a better ‘life’ and a home. For that, we needed monetary support. After research, ‘crowd funding‘ seemed to be the best match for the situation. After almost a year of immense hard work and constant support from Milaap and all the donors, the campaign has turned out to be a success. We were quite close to reaching our target amount but the funds collected throughout the period of this campaign are enough for Anjana to eliminate most of her difficulties in her daily life. Our aims for this project were based on finding real life solutions to real – life problems for Anjana and her family. After having a conversation with Anjana and informing her about the sum we have generated through this fundraising campaign, we reached to a mutual decision of creating a fixed deposit to provide her regular and secure monthly income and serve her in case of any emergency. The amount will be enough for Anjana to pay her rent and secure her house for many years. 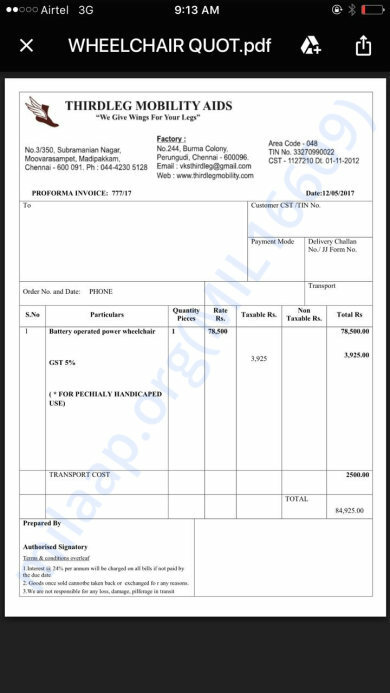 Moreover, as mentioned in the previous updates before, this amount will also be used to support her nephew and niece’s education and pay for the monthly health treatments of her paralyzed brother. We talked about the motorized wheelchair but after having a discussion and personally visiting her home, at the start of the campaign, we felt that the uneven terrain of the neighborhood and even of the place she sits to work at will be more of a trouble and even dangerous for her. Therefore the ideal solution will be to help her maintain a roof over head and support her household, as she is the sole breadwinner of her family. We’re still discussing over the matter of buying a kiosk for her to work and if Anjana’s fine with buying it, we’ll allocate the required amount of money to help her buy the kiosk. 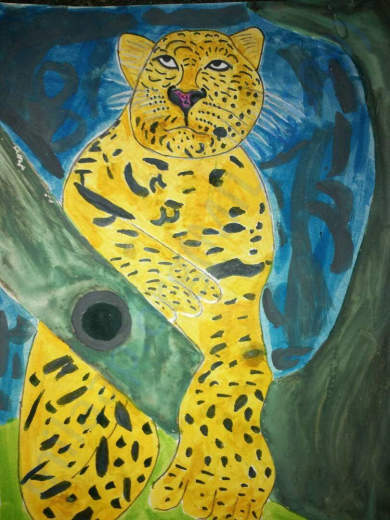 Moreover, along with few more students we’ve decided to upscale the project and hold an art exhibition. It is scheduled to be held in the month of May, where we’ll be exhibiting Anjana’s paintings and even the paintings of young artists. This event will be having media coverage and we’ve even decided to call some famous artists. This will be an ideal way to provide Anjana with new opportunities and connect with her artists that are keen in supporting her to move forward with her talent. Determination like hers is hard to find and in spite of the difficulties she faces, we are completely amazed by the positive demeanor she keeps at all times. 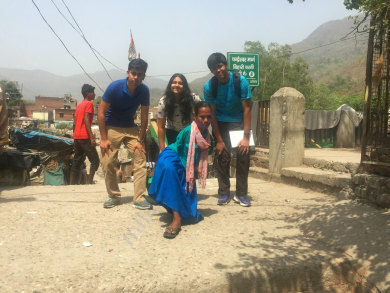 Our team and Anjana, personally, thank you for all the support that you’ve provided, be it the monetary support or those heartfelt, motivating messages for Anjana. With the funds generated and most importantly the blessings and encouragement that you all have given will definitely assist Anjana to transform her dream into reality in many ways. Here is a quick update on Anjana Malik. Anjana and her family are doing good. We are planning to use the funds to help her set up a small house or rent a house for stay. We are also looking forward to buying a wheelchair using the funds raised. Thank you for your support and love extended for Anjana.